Travel to Cairns allows you to explore the largest reef system in the world and the only reef system visible from space– the Great Barrier Reef. As the largest coral reef in the world, the Great Barrier Reef Marine Park attracts thousands every year for its extreme beauty and uniqueness. Plus, it’s World Heritage listed, which means it’s protected to maintain its spectacular beauty and diversity of marine life. When you visit Australia’s Great Barrier Reef, you’re able to dive into the water for snorkeling and diving excursions, or experience the reef from above on a liveaboard or helicopter tour. Australia’s Great Barrier Reef contains an abundance of marine life as it consists of more than 3,000 individual reefs, each offering lush, vibrant hard and soft coral gardens. The reef is also home to hundreds of islands, featuring amazing beaches and hideaways to explore. As one of the seven natural wonders of the world, you’ll discover Australia’s greatest treasure and one of the most highly sought travel destinations in the world. 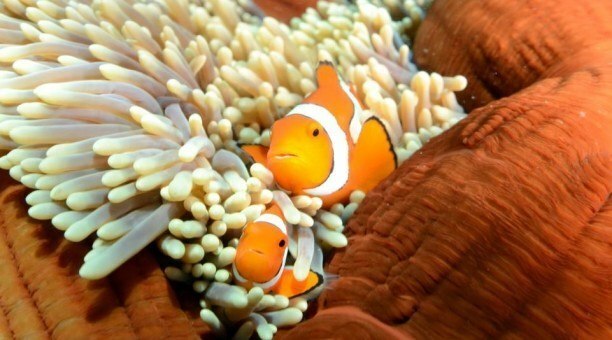 When you visit the Great Barrier Reef Maine Park, you’ll find more than 1,500 species of fish, including many rare fish. The reef is home to 411 types of hard coral and one third of the world’s soft coral, which are actually living creatures! You’ll come up close to an abundance of marine life as there are 134 species of sharks and rays that frequent the waters, including the white tip reef shark. Six of the seven species of sea turtles also call the water of the Great Barrier Reef home, as well as 30 species of marine animals. You’ll spot dolphins, dugong and even humpback whales! Within the reef, you’ll spot as many as 3,000 mollusks and thousands of sea sponges, worms and crustaceans. Even from above, the beauty of the reef doesn’t stop. You’ll see 215 species of bird, including 22 sea birds. Many choose to visit the Great Barrier Reef because it’s said to have the best scuba diving destinations in the world, including wreck diving. With many diving sites available, no two diving trips are the same and there’s always something new to see. While exploring the Great Barrier Reef, you also have the opportunity to find adventure in another world heritage listed site– the Daintree Rainforest, the oldest living rainforest in the world. It’s the only place in the world where two World Heritage listed regions connect!